The trends that led to Donald Trump's statewide victory in Michigan also affected Kalamazoo County. Trump did well in rural areas. 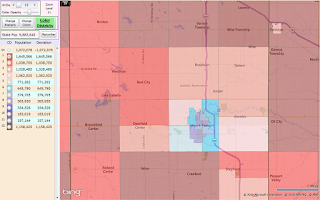 He also did much better in downscale areas of Comstock and Galesburg. 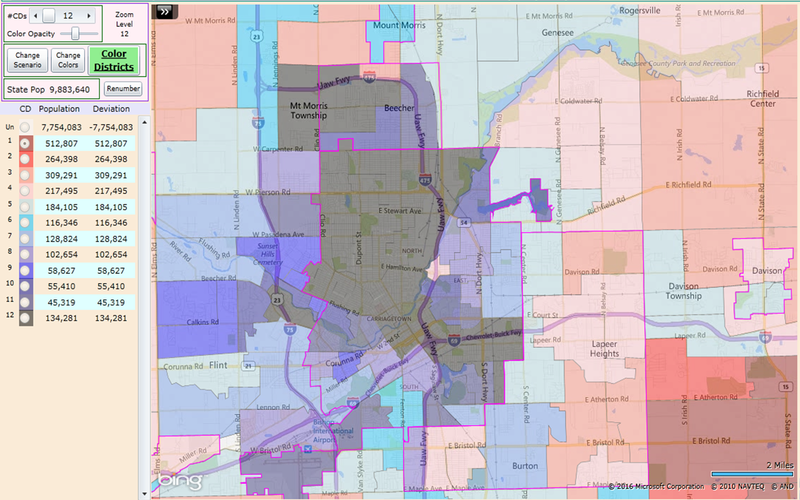 He did badly in Kalamazoo and underperformed in upscale areas of Portage and Oshtemo. Trump got the same two-party percentage (43.2%) as Romney in Kalamazoo County. The following map compares Trump and Romney. More green is better for Trump, more yellow/orange is worse for Trump (better for Romney). 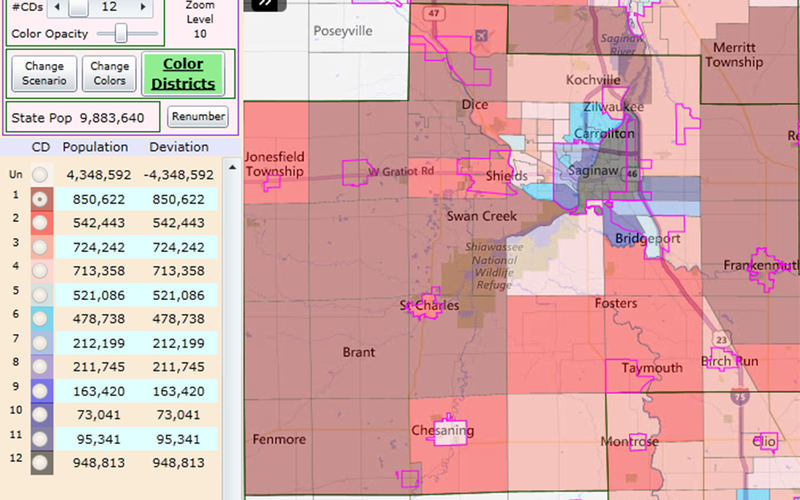 Trump did best relative to Romney in Galesburg, Comstock 1-3, and K Township 1, all downscale areas. Trump did worst relative to Romney in Portage 18 (Moorsbridge), Oshtemo 3, suburban Texas, and Bronson Boulevard, all wealthy upscale areas. The State Board of Education can be used as a measure of generic R and D vote since almost nobody is familiar with the candidates. The two-party percentages are Trump 43.2%, SBOE 48.1%. Trump underperformed Republicn SBOE candidates everywhere except Comstock and Lakewood. 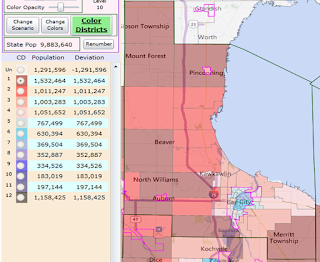 He did especially poorly in Western Portage, southern Kalamazoo, Texas, Oshtemo, and Gull Lake (all wealthy upscale areas). 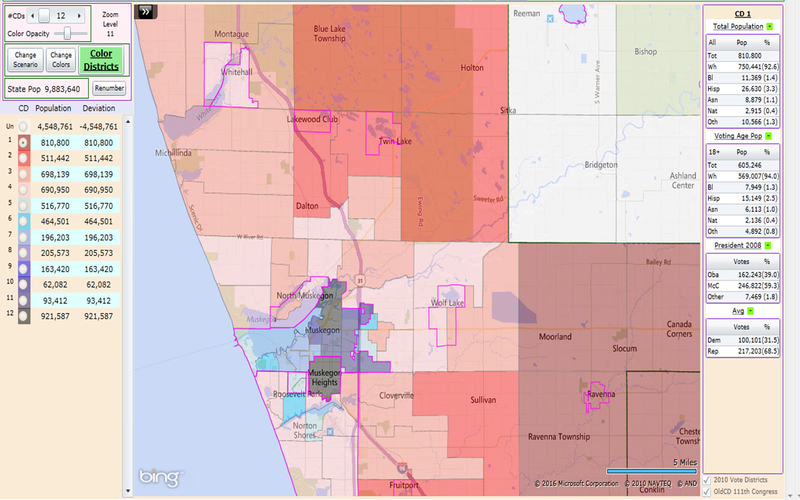 The following maps show how local Republicans did in Kalamazoo County. 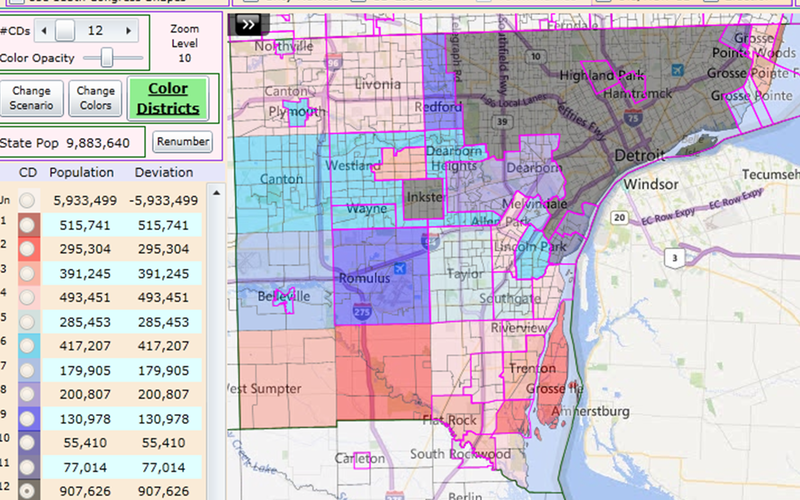 Kalamazoo County Treasurer Mary Balkema led Republicans in Kalamazoo County with 54.7%. The GOP average (President/Congress/Clerk/ Prosecutor/Sheriff/Treasurer) was 45.6%. The most R precinct was #4 (Knollwood). I suspect this was due to Fraternity Village supporting Trump. 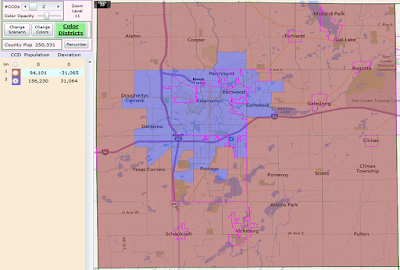 The City of Portage saw many voters split tickets. Oshtemo Township has moved left in recent years. The top of the ticket was too much for local candidates to overcome. Federal Judge Gershwin Drain extended straight ticket voting in Michigan after the legislature passed a law to eliminate it. 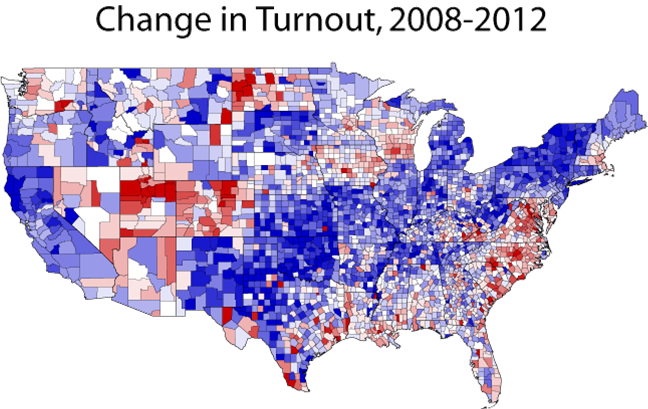 After the election, some observers claimed that straight ticket voting benefited Republicans since in some counties (e.g. 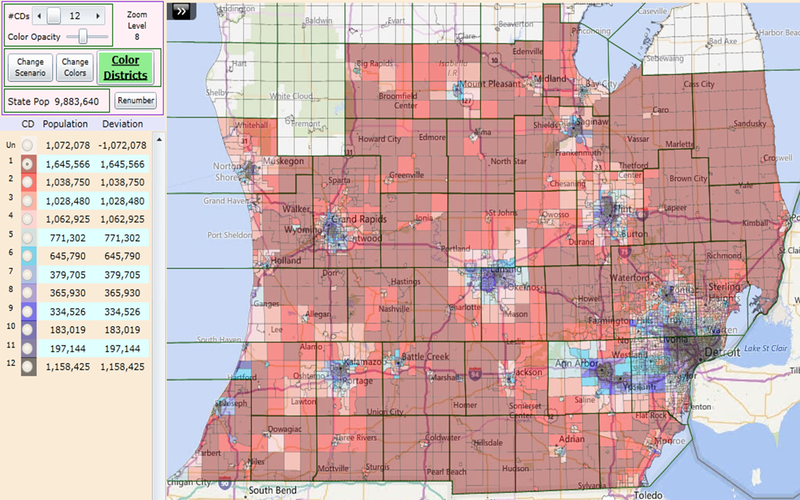 Macomb) more Republicans voted straight ticket. However, we don’t know what people would have done in its absence. In Kalamazoo, more democrats voted straight ticket (33218) than Republicans (25159). 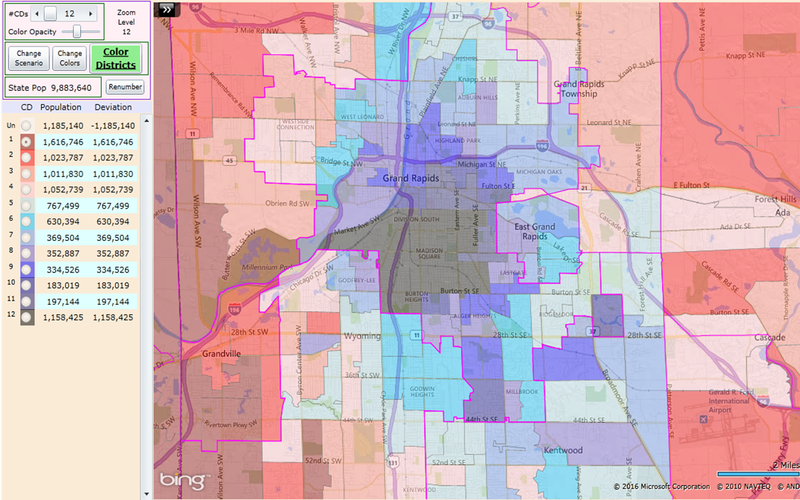 The following map shows which party had more straight ticket voters in each precinct. The margin was only 10704 votes. 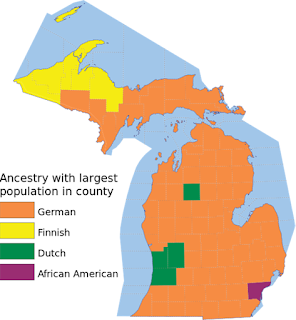 Michigan had the closest percentage margin of any state in the nation. 1. Trump won huge margins in rural areas. 2. Trump improved significantly in downscale (white working class) areas. 3. Trump did poorly in upscale (wealthy, highly educated) areas. 4. Clinton won blacks by large margins, but turnout was significantly down. The following maps show Trump/Clinton and Romney/Obama by county. Trump did significantly better than Romney in the rural Northeast and Midwest. This allowed him to pick up five states (and Maine 2) in this region. 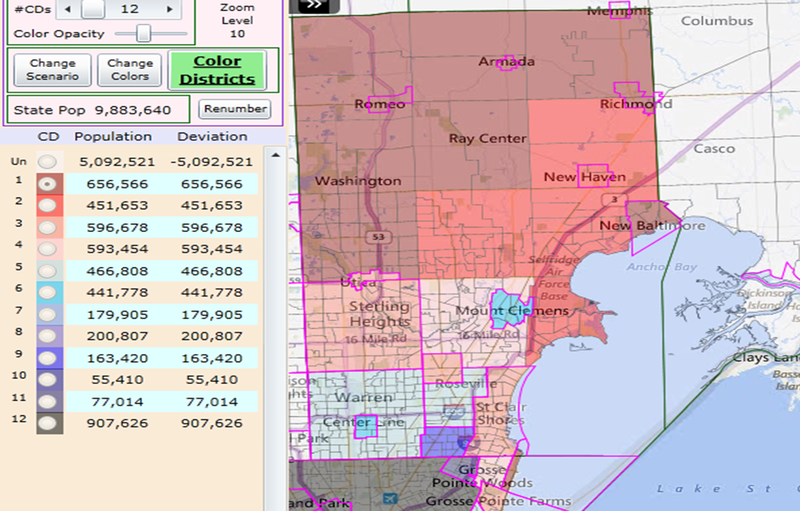 Trump did worse than Romney in many suburban counties. 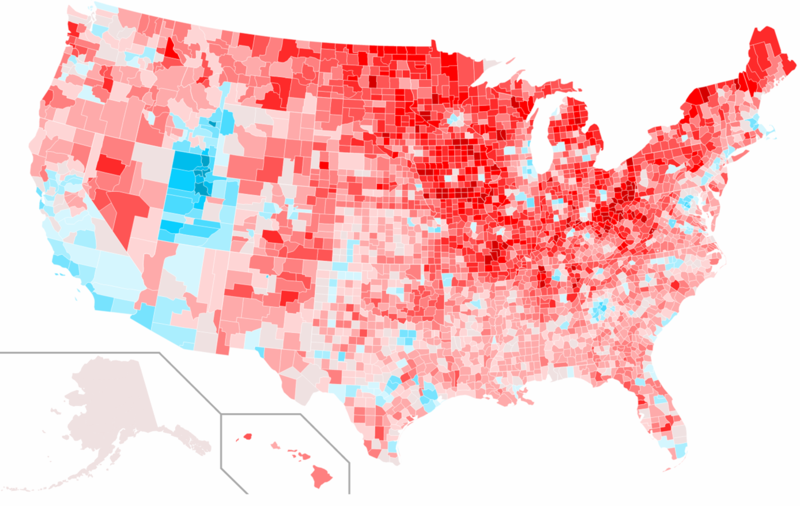 The following map compares Trump and Romney’s performance by county. More red means Trump performed better. Zooming in to Michigan, we compare Romney 2012 and Trump 2016. 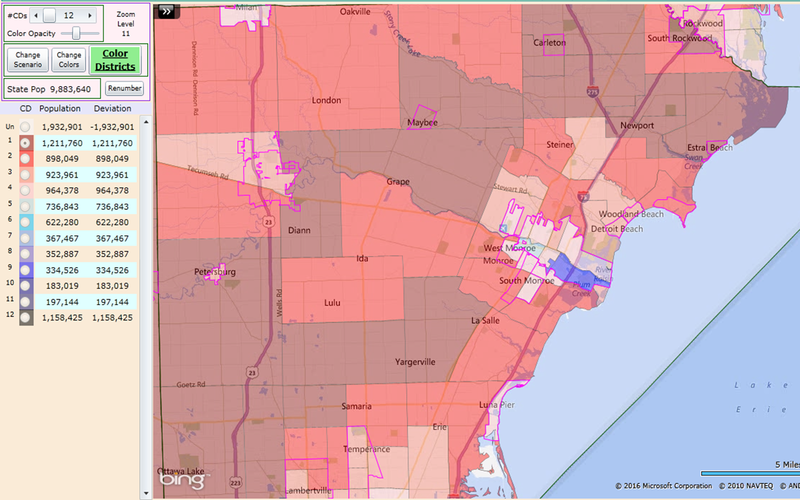 Trump overperformed in most rural counties, particularly in northern Michigan and the Thumb. He underperformed in Kent, Ottawa, and Washtenaw counties. Results are broken down to the precinct level, except in Wayne, Macomb, Ingham, Livingston, and Montcalm Counties, where they are broken down to the municipality. All maps use 2-party totals. 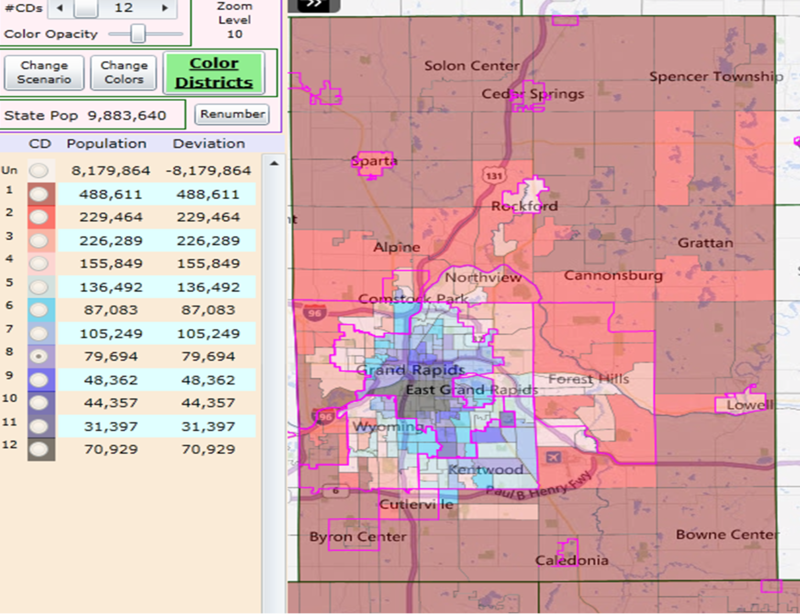 Some results are approximate due to changes in precinct lines. 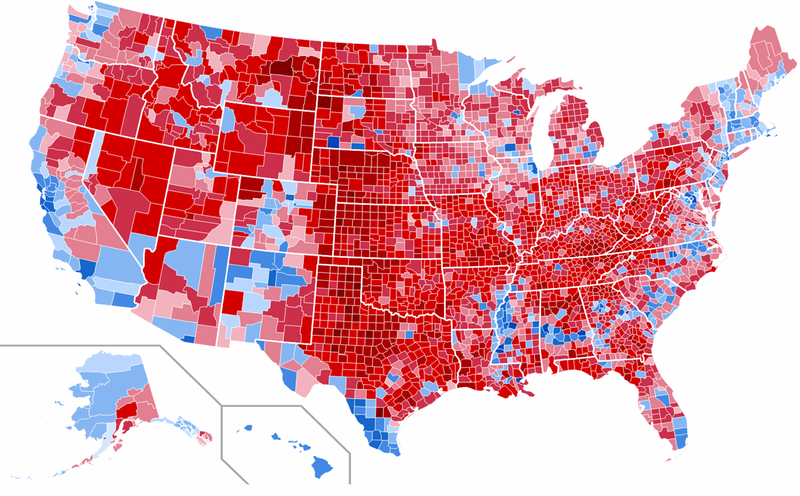 Rural areas are overwhelmingly red; cities are blue to black. Let’s take a closer look at some key areas of the state, starting with Detroit. The percentages are about the same, but D turnout was down 46872 votes in 2016. 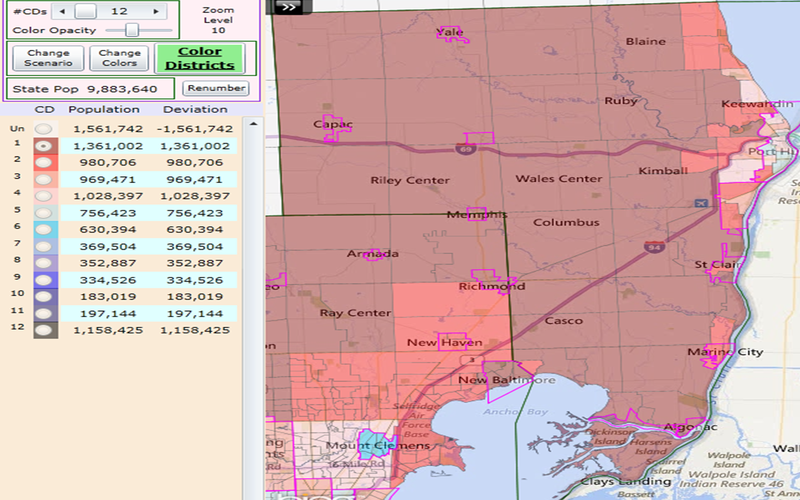 Here is Wayne county, broken down by municipality. Here are the numbers for Wayne outside Detroit. Trump improved by 43045 votes in Wayne outside Detroit. Trump gained in Downriver, a downscale union area. Trump declined in upscale areas – the Grosse Pointes, and Plymouth/Northville. Trump gained 64451 votes over 2012. He improved substantially in the downscale union areas of the county. 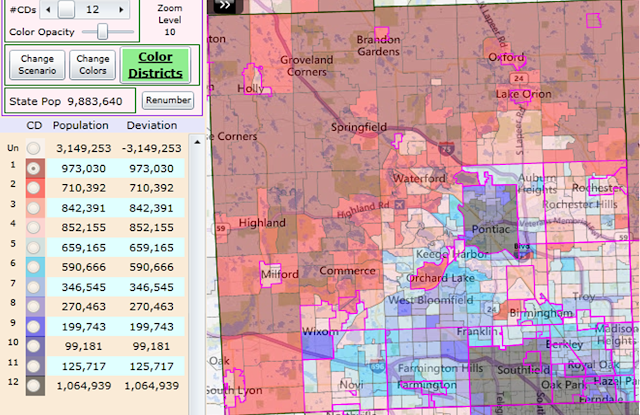 Trump lost upscale areas, including Bloomfield, West Bloomfield, Troy and Novi, where Republicans usually win. He gained in Waterford. The following compares Romney (2012) and Trump (2016). Trump improved by 38594 votes over 2012. 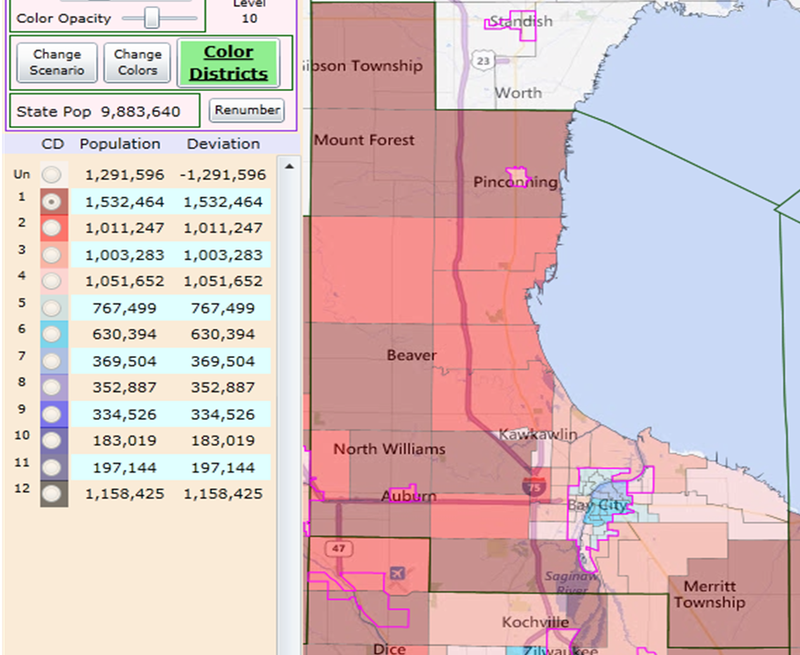 Trump gained significantly in the downscale union-heavy suburbs of Flint. 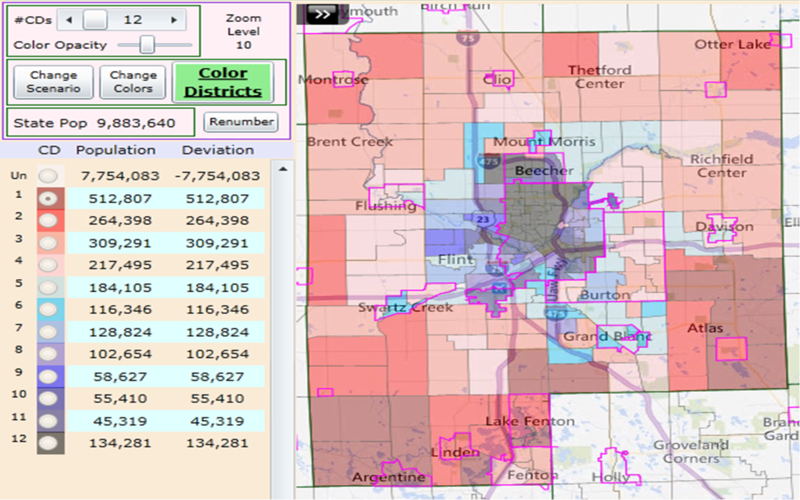 He won Burton and the entire outer ring (except Grand Blanc). Republicans came within 4% of picking up state house district 50 in the suburbs, which was completely unexpected. Here is a closer look at Flint. Trump even won Port Huron. 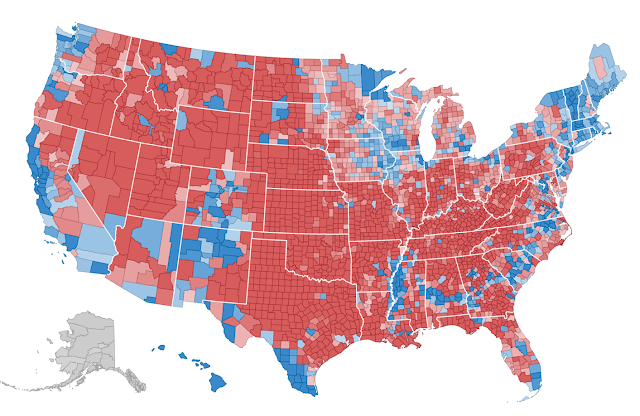 Trump won everything except the minority areas. In past elections, the city of Midland has been more Republican than the surrounding areas. Not this time. Trump declined by 13020 votes in Kent County. He lost Kentwood and did poorly in Wyoming. 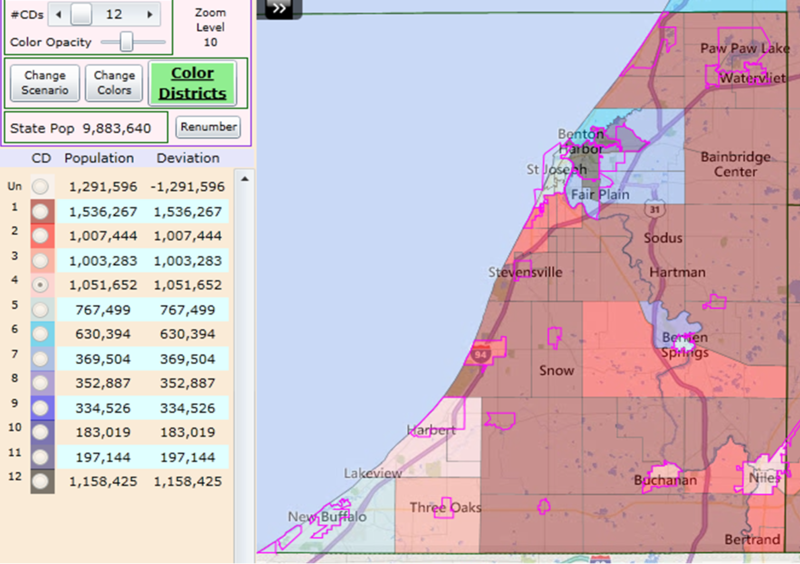 Ottawa County is usually the most Republican in Michigan. Why did Trump decline in Kent and Ottawa? Ottawa, Kent, Allegan, and Missaukee are the only Dutch majority counties. Dutch Americans tend to be Calvinists (Reformed/CRC) and solid Republicans. Consider this list of Trump's best counties in 2016. Ottawa County dropped to number 32! Livingston dropped to 34 and Allegan to 48! 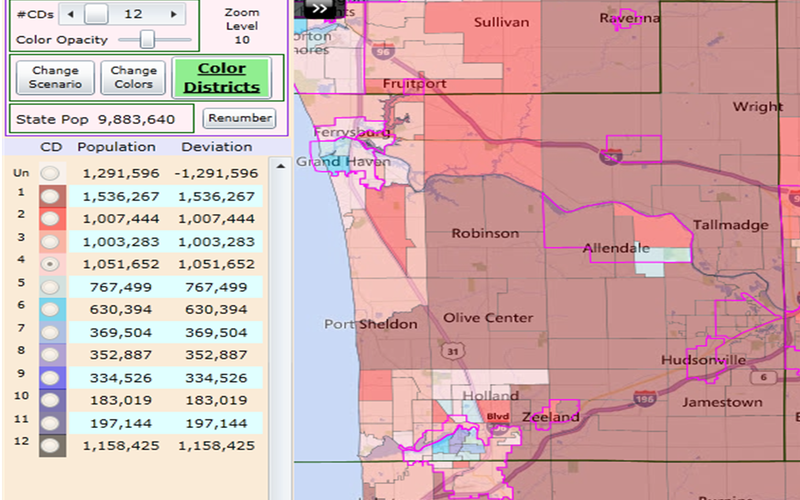 Twelve of Trump’s 20 best counties are in the northern lower peninsula. Four of the top 14 are in the Thumb. Two (Luce, Dickinson) are in the UP. 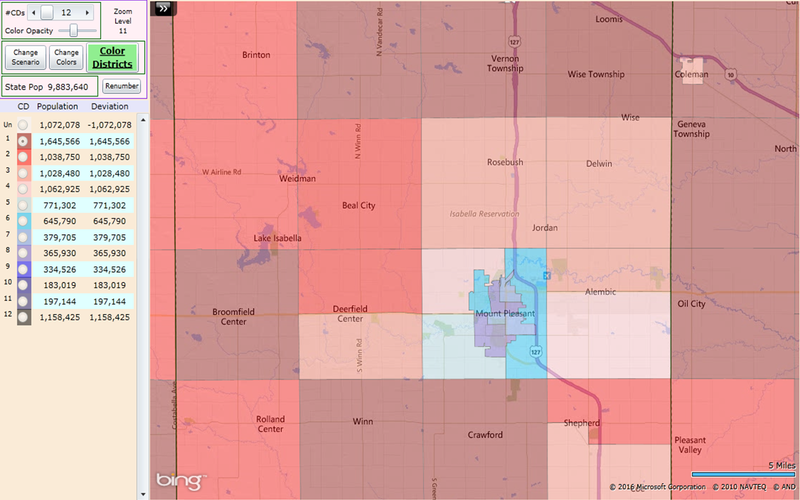 Two (Hillsdale, Branch) are on the IN border. 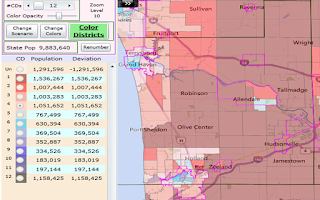 Trump got 60-70% in 43 of 83 Michigan counties. He got 50-60% in 23 counties. These are almost all rural areas. I have explained where Trump got his votes, but not how he got them. Trump appealed to rural and working class voters with immigration restriction, opposition to free trade agreements, and concern for manufacturing jobs. These voters were alienated from the democrats due to social justice warriors and environmentalism. Bernie Sanders’ primary win in Michigan foreshadowed trouble for Hillary. Rural democrats are not primarily socialists. Many were clearly disenchanted with Hillary. This obviously applies to Trump as well. “Romney could have won the Electoral College in what can be called the Big Ten states … He did win Indiana, and he lost Obama’s home state of Illinois badly. The other six states in this region, however, all slipped through his fingers: Iowa, Minnesota, Wisconsin, Michigan, Ohio, and Pennsylvania. Sean Trende of RealClearPolitics wrote a series of articles in 2012/13 arguing that several million white voters went ‘missing’ between 2008 and 2012. Demographics are the biggest factor affecting election results. For example, some areas have voted for the same party since the Civil War, until very recently. Dutch Americans have voted conservatively since immigrating here. Often, changes in election results are the results of demographic changes rather than ideological changes. 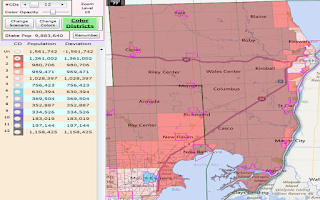 Demographic groups can change voting patterns (e.g. downscale whites going for Trump), but such changes are neither easy nor inevitable. Democrats have been using immigration from left-leaning groups to bring about electoral victories they could not win by persuasion. Trump and his supporters need to stop this for conservatism to remain viable in America. Donald Trump is now the face of the Republican party. His supporters should do what they can to encourage him to adopt sound conservative policies. There are no permanent majorities. Republicans should be careful not to overreach (as Obama did with Obamacare). Conversely, Republicans should accomplish what they can while the opportunity exists, as democrats will come back sooner or later. Republicans should welcome Trump’s downscale supporters into the party and try to address their concerns on trade and immigration while upholding conservative values. Upscale voters were likely alienated by Trump’s rhetoric and character. If Trump is successful, many will come back. We should run candidates who emphasize competence to appeal to this demographic.